"This oddly named dessert promises juicy berries topped with biscuity dumplings, and there is no need to turn on the oven. But it can easily become a soggy, bland mess. Do not use frozen blueberries here, as they will make the filling watery. You will need a clean kitchen towel for this recipe." 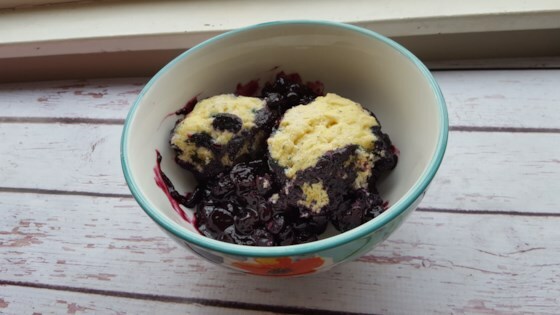 Combine 4 cups blueberries, 1/2 cup white sugar, 1/2 teaspoon cinnamon, water, and lemon zest in a Dutch oven. Cook and stir over medium-high heat until mixture has thickened and has a jam-like texture, 10 to 12 minutes. Whisk lemon juice and cornstarch together in a small bowl until smooth; stir into blueberry mixture. Add remaining 4 cups blueberries to the blueberry mixture; cook and stir until blueberry mixture is heated through, about 1 minute. Remove pot from heat and cover to keep warm. Mix buttermilk, butter, and vanilla extract together in a measuring cup. Whisk flour, baking powder, baking soda, salt, and 6 tablespoons sugar together in a large bowl. Slowly stir buttermilk mixture into flour mixture until dough forms. Scoop dough using a small ice cream scoop or 2 large spoons and drop golf ball-sized dumplings atop blueberry mixture. Wrap lid of Dutch oven with a clean kitchen towel to absorb condensation during cooking. Cover pot with the towel-wrapped lid, keeping towel away from heat source. Simmer grunt until dumplings have doubled in size and a toothpick inserted in the center comes out clean, 16 to 22 minutes. Mix 1/2 teaspoon cinnamon and 2 tablespoons white sugar together in a small bowl; sprinkle over dumplings. This is such a cozy, homestyle dessert. Perfect with a scoop of ice cream. I've also made this with blackberries.